Helpful Hints: Add a teaspoon of brown sugar to your chili to cut the acidity. Top with Cheese or Crispy Jalapeno's as a change of pace. Carroll Shelby's custom chili kit features individual packets of spices, cayenne, masa flour, and salt that let you season two pounds of meat just the way you like. Delicious on its own or atop burgers, tacos, or salads. Just add creativity and your own special fixin's. Corn masa flour, Cayenne pepper, ground chili peppers, Garlic, Onion, Cumin, Oregano, paprika and salt. 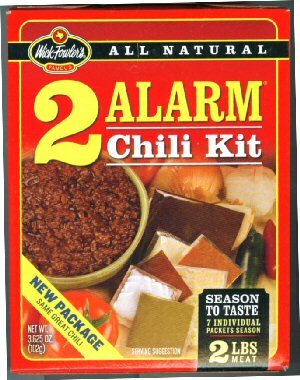 Everyone's favorite Chili Seasoning blended with the purest ingredients to give you great chili every time! SEVEN individual packets of seasoning! Recipes included! 7 Seasonings Included! Sloppy Joes are a timeless recipe that is has been a family favorite for decades. Mrs. Dash Sloppy Joe Seasoning Mix brings this ageless dish back to your table. This dish is sure to be a hit with children and adults alike. spices and seasonings has extended to include this delicious taco seasoning. Chicken: Make a delectable concoction using only our chicken chili seasoning, white corn, northern beans. All you do is just simmer to perfection! A robust blend of the finest ingredients with the Smoky Chipotle pepper taste added for that unique Williams flavor!